Powder Coating 202 - Optimizing Your Powder Operation with Lab is a 2-day hands-on advanced workshop that focuses on in-depth knowledge of all aspects of the powder coating process. All PCI training is conducted by industry experts in an unbiased and commercial-free manner. CLICK HERE to download the complete agenda. Registration fee includes: Powder Coating Finisher's Handbook, a printed copy of the presentations, lunch each day, networking reception, and certificate of completion. The 202 Workshop will be held at Wagner Industrial Solutions. The following are suggested hotels. PCI does not provide transportation to/from the workshop. Attendees are welcome to stay at hotel of their choice. 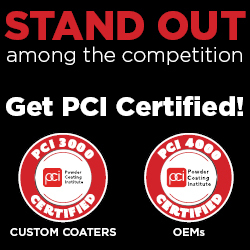 A person with basic knowledge of powder coatings (3 or more years of experience recommended) and/or prior attendance of PCI's Powder Coating 101 workshop.